New polling on key Brexit trade-offs has important implications for the UK’s choice when negotiating trade deals post-Brexit, according to a report from IPPR, the progressive policy think tank. 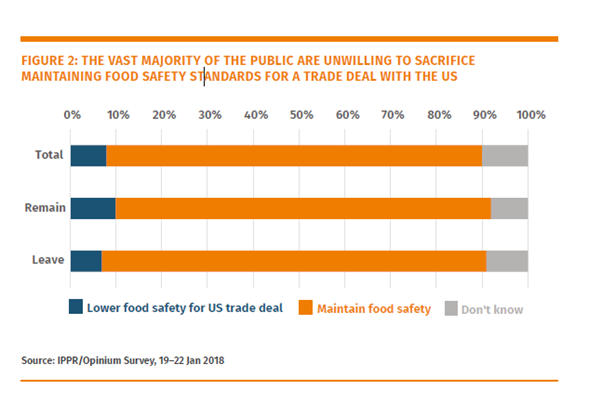 The polling shows that, when asked whether the UK should lower food safety standards to secure a trade deal with the US or retain current standards, only 8% of the public think the UK should lower food safety standards, with 82% preferring to keep standards as they are. The polling for IPPR by Opinium shows not only that the public favour high standards over deregulation post-Brexit – it also shows that the public explicitly favour alignment with EU standards to secure a far-reaching EU trade deal over deregulating. The report also shows that remain and leave voters are overwhelmingly united on their choice: leave supporters are just as opposed to food safety deregulation as remain supporters, and there is strong opposition across the political spectrum. This shows widespread public support for EU derived food standards over a deregulated approach which would allow the UK to trade more freely with the US. As previous IPPR work on standards showed, if the UK does diverge from EU rules and standards post-Brexit, it would need to find another country or trade bloc to which it can align, the most likely option being the US. But this new polling suggests that the British people would rather maintain EU standards, rather than diverging and aligning with the US, particularly on food standards. There has been widespread worry about the UK food industry’s standards post-Brexit with regard to food safety and animal welfare, and practices banned under EU regulations but allowed in other countries such as hormone-treated beef. The National Farmers Union President recently said that farmers would not compromise on food standards post Brexit, as food safety was a public right. 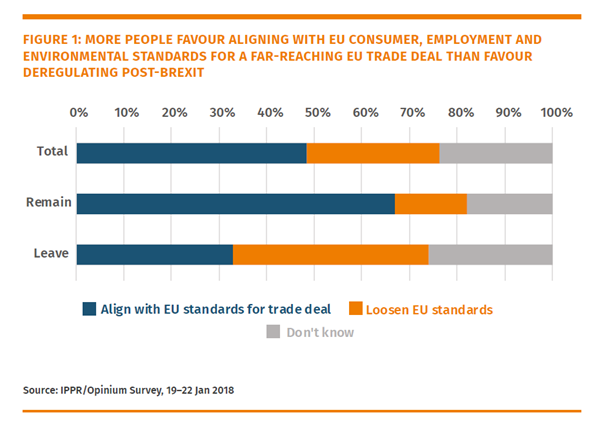 that when asked whether the UK should align with EU consumer, employment and environmental standards to secure a far-reaching EU trade deal or whether they should instead loosen those standards to save costs for UK business, 49% prefer alignment with EU standards, with only 28% preferring deregulation. Excluding those who didn’t know how to answer the question, 64% prefer continued alignment with EU standards. Londoners and younger respondents tend to be the most relaxed about accepting food safety deregulation in order to secure a US trade deal: 17% of 18–34-year-olds, 20% of higher-grade professionals/managers/administrators, and 21% of Londoners are in favour, compared to 8% on average. This suggests that support for a US trade deal with lower food standards is not necessarily concentrated among Leave voters, but is instead concentrated among young middle class Londoners. Londoners and younger respondents tend to prefer regulatory alignment with the EU in return for an EU trade deal over lowering standards. In one light, this appears contradictory: the same groups express a preference both for deregulation to secure US trade and for high regulations to secure EU trade. The likely explanation is that these groups are simply more relaxed about trade, and are more willing to make compromises – of whatever sort – to secure free trade agreements with other countries. 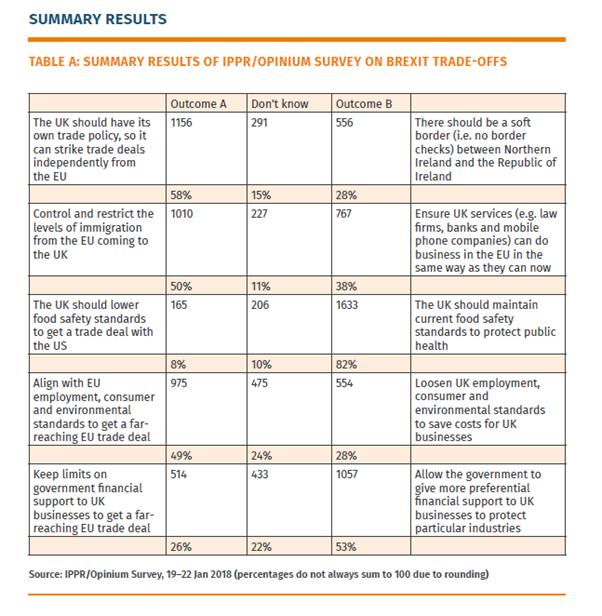 In part one of this series of briefings on attitudes to Brexit IPPR also found that the public strongly support retaining or strengthening a range of EU-derived consumer, employment and environmental regulations. The briefing is based on new public opinion research from the polling company Opinium. The online survey took place between the 19th and 22nd January 2018 and sampled a total of 2,004 UK adults. The survey was weighted to reflect a nationally representative audience. Summary results are below. In a series of two briefings, this being the second, IPPR has explored the public’s perspective on this choice by detailing the results of new polling on attitudes to EU regulations and a range of critical Brexit trade-offs now facing the country.